The WordPress community of Birgunj is all set to organize a local meetup for the month of September – WordPress Birgunj September Meetup 2018. The meetup will be held tomorrow (29th September) at Miniland English Boarding School, Birgunj. The meetup will be kicking off from 11 A.M. and is expected to run until 1 P.M.
WordPress Birgunj September Meetup 2018 is going to be a basic workshop for beginners in WordPress. Mr. Sonu Gupta is the main speaker for the meetup and will be conducting the basic WordPress workshop. He will be presenting on how one can get started on the WordPress platform and create a website using WordPress. Similarly, Amit Chaurasiya and Pallavi Kalwar will also be hosting the meetup and will assist the participants during the workshop. WordPress is undoubtedly the most popular CMS platform on the web and currently powers more than 30% of the web. 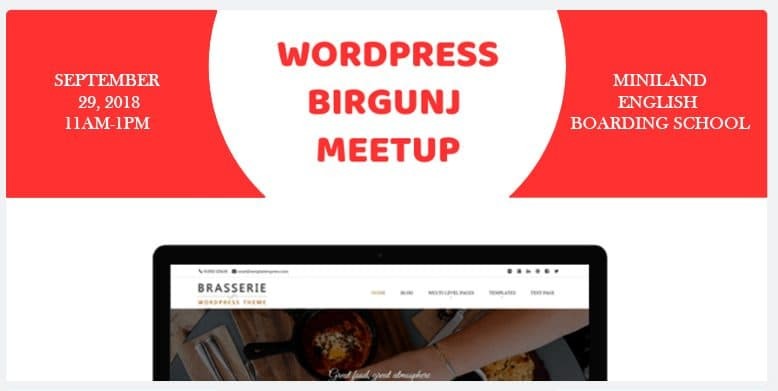 As WordPress Birgunj September Meetup 2018 will be focusing on the basic hands-on workshop using WordPress, you will learn how you can use it and create a website of any kind. So, basically, you will learn all about basic set up and also how to use WordPress to create your own website. WordPress Birgunj September Meetup 2018 is an open program and welcomes every WordPress enthusiasts. Register here to let the organizers know that you’d be attending the meetup. The registration is completely free. Also, you will get a chance to meet the speakers and other WordPressers during the networking session which will take place after the meetup. For more details about WordPress Birgunj September Meetup 2018, check out the official event page on Meetup. You can follow the official Facebook group of WordPress Birgunj to know more about the community.